Do you crave the opulence of Renaissance nobility? Are you enamored of the decadence of Baroque aristocracy? 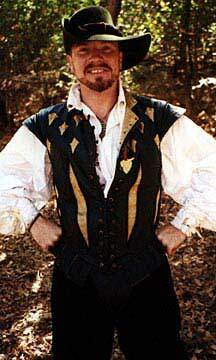 Do you long to be a dashing cavalier, a dangerous pirate, a proper Victorian, a liberated, modern flapper? Your time-traveling opportunities are unlimited. Let Jurnecka Creations help you create your alter ego. 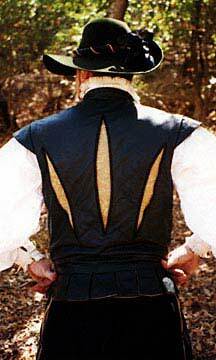 1500's Elizabethan gentleman wearing black leather and gold brocade doublet, with coordinating Venetian breeches 1500's Elizabethan gentleman in leather and brocade doublet. 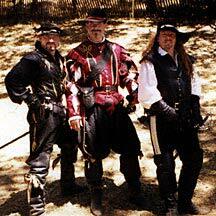 Manly Men in Tights/The Albion school of defense - three dashing Elizabethan swordsmen in their finery. 1670 's - King George, take notice! The green brocade coat is lined in gold satin and worn over a long rose brocade waistcoat with ruffled shirt and knee breeches and coordinating plumed cavalier hat. 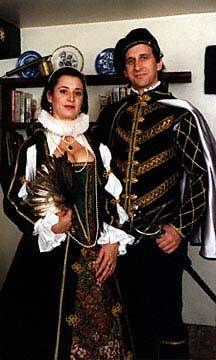 The lady is wearing a black velvet overskirt and bodice trimmed with tapestry and gold braid. Her white cotton partlet has wrist ruffles and a detachable lace ruff at the neck. Her open sleeves are detachable, so the bodice may be worn sleeveless. The underskirt is multicolored tapestry. The gentleman's ensemble consists of a silk velvet doublet with detachable open sleeves, heavily trimmed with gold braid and pearls, worn with matching Venetian breeches and a full capelet of silk velvet and silver charmeuse. 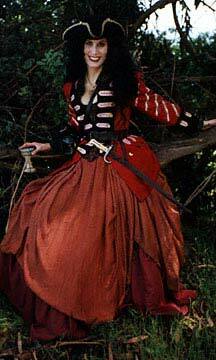 1780's buccaneer - this pirate wench is wearing an 18th century brocade corset under a wool coat with coordinating tricorne. Two layered full skirts complete the look. 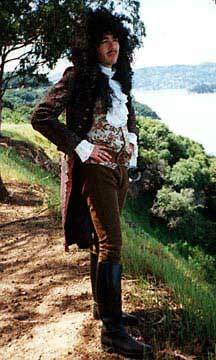 1780's buccaneer - A somewhat rakish look at 18th century finery. 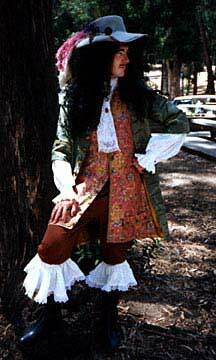 The brocade coat is worn over a tapestry waistcoat, ruffled white shirt, and knee-length breeches.